I have been getting a lot of questions lately about fruit carving tools and I thought I would take the opportunity to review a couple of complete fruit carving tool sets that are good for first time buyers. 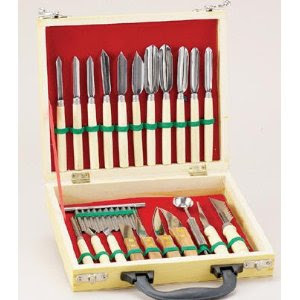 I kept in mind that the set should have at least one of each basic tool including a knife and should be moderately priced. I feel that this one is the best deal for the money because it has the most common, usable pieces at a reasonable price per piece. 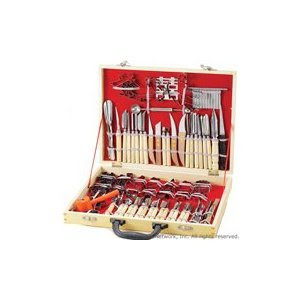 This set includes multiple sizes of each type/shape of tools and knifes that would cover a wide variety of designs. Negatives: Wood handles are not dishwasher safe and requires hand washing and drying of tools. 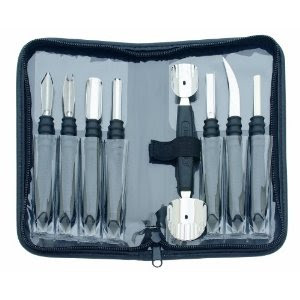 Silicone handles makes these tools dishwasher safe and easier to grip, vinyl pouch carrying case with zipper makes this set compact and portable and the quick reference card with description of each tools uses is great for beginners. Negatives: Only one size of each tool included in set. This is the set I own and it is the most complete set I have ever seen in the under $150 price range. It has all the tools from the 22 piece version as well as 24 more tools that are a little more uncommon but still very useful. It also includes 34 stencil/cookie cutter shapes, 8 of which are Chinese lettering or symbols. Great set for someone who is serious about fruit and vegetable carving but may be overkill for someone who is new to fruit carving.